You’ve heard of Spring Cleaning, of course. But what about Autumn Cleaning? The leaves are dying and falling from the trees, ready to rot down over winter to feed the new growth in the Spring. Fruits and berries are likewise softening, ripening and falling to the Earth, their seeds ready to lie dormant until they begin to grow in the Spring. Autumn is a great time to release what is dead in our lives, let go of old, worn patterns, and make space ready for new things to come. It’s also the perfect chance to clean up our homes and living spaces, before we settle in and get snuggly for the winter! This September, I want to take you through three cleanses as Autumn approaches, where we can clean our our personal energy, the energy in our homes, and our physical living space too! You can take part in as many or as few as you choose. While this is a Pagan blog, I know I have some non pagan followers, especially those of Abrahamic religions. You can join in too! Anyone can do this! I aim to include modified versions in all three areas which are suitable for other religions (or none), and suggestions for modifications to fit your own beliefs. Over the next week, I’ll be releasing 3 more blog posts, one for each area. Maybe you keep shutting the door on the garage, promising to tidy it next week? Or that pile of paperwork in the corner of the kitchen. Be ruthless, and list those problem areas! Or, do you just need a good, deep clean of the place? Sweep those cobwebs (although, it’s nearly Samhain/Hallowe’en so you can argue they’re decorations! ), scrub those skirting boards and retrieve treasure from down between the sofa cushions! Are you calm? Stressed? Have there been lots of arguments, or have you had lots of love? What kind of environment do you want your home to have? This could be purging habits, like stopping smoking, or spending too much time attached to social media. Or it could be time to put old hurts away in a box, and respcetfully let them sit in peace, while you move on with your life. Even by beginning to think about all this, you’re subconsciously telling yourself you’ll get this stuff done. If it feels right, write brief key words for each of the three points on a piece of paper, read them out loud, and then (safely) burn the paper. Focus on you achieving it as you do so. I remember first doing this back when I was a Christian, having been taught it at youth group, and I definitly still do this now I’m a Pagan! Writing intentions, or things you want to forget or leave, and then burning them is a brilliant way to get things moving. Whether you are symbolically sending up your prayers to God, or asking the purifying energy of fire and transformative power of air to assist your aims, or just seeing the things you want (or want to leave) becoming empowered with heat, or turning into ash, it’s a simple thing anyone can do. Remember safe fire practices: Keep fire and matches away from kids and animals, use a fireproof container, don’t leave fire unattended, don’t create a lot of smoke in a confined space! Please check back soon for more details and activities as we clean up our September and transform our lives! 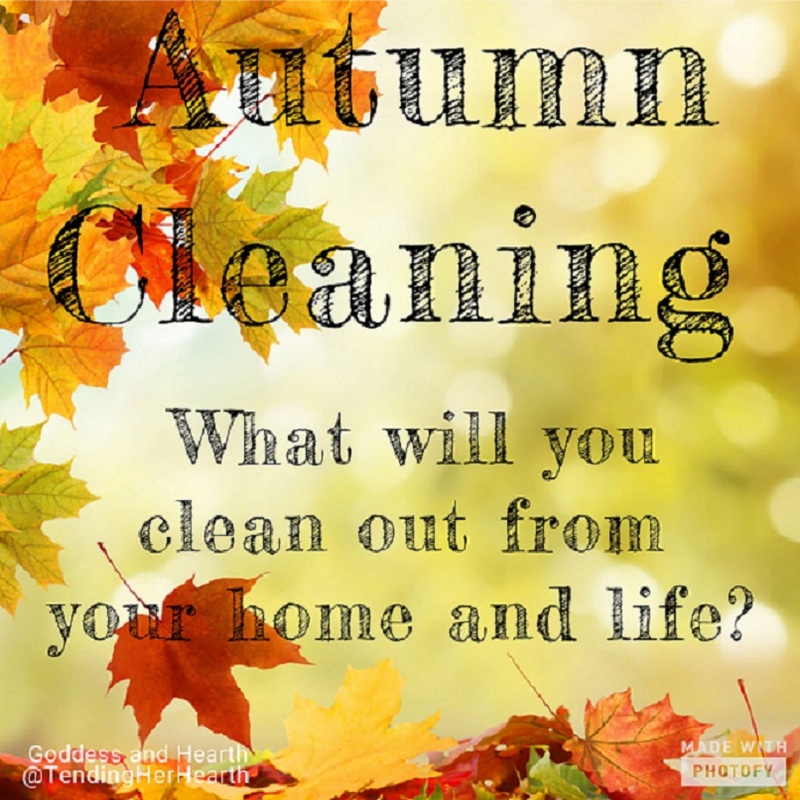 Next Autumn Cleaning – Part 2 – Clean your house easily!